Here is the fourth and last review of what has turned out to be a pretty mediocre run of Signatory exclusive casks for K&L. Will this be the one to go past 80 points? 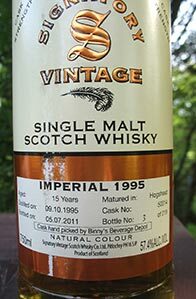 I wasn’t terribly impressed with the last two Signatory Imperial 1995s for K&L that I reviewed: those were this 19 yo from last year and this 17 yo from their 2013 run of exclusive casks: I recorded 85 points for the 19 yo and 84 points for the 17 yo. Frankly, after the lackluster Linkwood, Glenburgie and Dufftown from this go-around I’d be very happy if this were a 84 point malt! At any rate, I am very glad indeed that I was able to taste all of these through bottle splits instead of buying full bottles of what seemed like “good values” that I would have completely regretted—as I have on many occasions in the past. This inaugurates a brief run of reviews of a number of K&L’s recent barrel selections from Signatory. These are all at cask strength—though in the cost-saving UCF bottles—and I believe they may all still be available (these notes are being taken long before this review will be posted and I am probably not going to remember to go back and check: you’re welcome!). I acquired these as bottle splits for the purpose of deciding if I wanted full bottles—my findings may be of interest to you as well. This Imperial was bottled by Signatory for K&L as part of their 2013 release of handpicked casks. I bought a number of these and I’ve had decent to bad experiences with the ones I’ve opened so far. This one, I’m sorry to say, also falls into middling territory. It made me decide to skip K&L’s releases this year—with my luck this may be the year that everything is very good and actually as described by K&L’s notes. 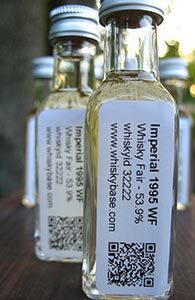 This Imperial was bottled for the Whisky Fair, which is one of the biggest whisky festivals in the world (perhaps the biggest in terms of reputation), held every year in Limburg, Germany. Quite apart from the official distillery offerings that show up at most festivals (and which dominate the lineups at the few festivals in the US) Limburg is famous for the esoteric and collectible bottlings, official and independent, on offer by the pour and by the bottle. And as at European festivals you are allowed to purchase/fill samples to take away, it’s an opportunity for geeks to get their hands on small pours of legendary whiskies, full bottles of which would cost a king’s ransom. And also to taste/explore new bottlings from boutique outfits. Every year I see whisky geeks in Europe talk online about heading out to Limburg and feel envious. Then I read the reports of the crowds which seem to rival the Kumbh Mela and feel less bad about being a whisky geek in the US (yes, there are some US based whisky geeks who go out to these festivals but that’s beyond my pay grade; if I had the money to spend I’d spend it on whisky). Who knows, maybe one year I’ll be in the neighbourhood for a conference at the right time…. Imperial is/was a Speyside distillery that seems to have spent more time being closed than open. Malt Madness has a sketch of its checkered history. Most recently it was closed in 1998. There were rumours for a while that it might reopen but the buildings were completely demolished this year. There will apparently be a new distillery constructed on the site–and it will likely bear the same name–but I am not sure if the stills etc. will be from the old distillery. If not, it may literally be a case of the distillery reopening in name only. 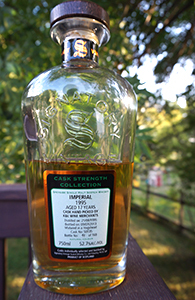 In recent years I’ve seen a few signs of some whisky geeks trying to make a case for Imperial as a hidden gem. My (admittedly limited) experience with the malt would suggest there is something quixotic about this. But who knows, it is entirely possible that if casks of Imperial sit undisturbed for another 20 years it too might emerge as another Caperdonich or Port Ellen.